The killing of terror mastermind Osama bin Laden might or might not result in revenge attacks, but a worldwide attack seems to have taken place. Yes, you have already become a victim of cyber attack if you were sent, shown, made to click any image or video appearing to be that of the dead al Qaeda chief. Advisory: In case you are seriously concerned, you must go through a brief prepared by me. It is being published below in your interest. Remember to share it with all your contacts to help make internet free of Osamas. Do your bit. Don’t fall in a trap. The above methods clearly bypass your mail filters because the message appears to originate from the recipient’s own account. This is becoming very difficult practice to guard against. How secure is net, you can well guess. A warning we all must pay heed to… a caution we all need to take. Read carefully and follow for your own good and do spread the word around. I wish you happiness always. Neeraj, nice article. Very informative specially your last sentence to keep changing the password from time to time is a very important advice. Some of them I was aware of but a reminder re-activates one specially in such critical moments in history. 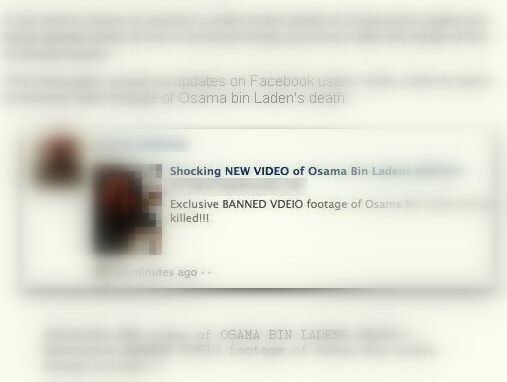 I am sure that Osama’s demise will provoke a lot of cyber crimes. Just one curiosity to ask you, “Changing your password frequently will not affect your mailings”?